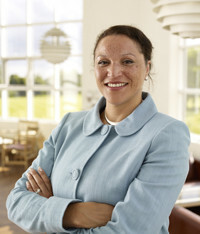 Suffolk County Council appointed Deborah Cadman OBE as its new CEO this evening after four candidates were interviewed for the position. Currently the Chief Executive of the East of England Development Agency (which is soon to be no more) she is a career local government officer and has been CEO at St Edmundsbury and Interim CEO at Waveney as well as working in a number of positions across the country including Birmingham City Council and the London Borough of Newham where she started her career in the Engineering Department. “I’m delighted and honoured to be offered this role which for me is the most exciting job in Suffolk. “The political direction at Suffolk County Council is clear and I want to work with the leadership, and with staff, who I know have a genuine commitment to delivering for the people of Suffolk. “Deborah is a first class chief executive and brings with her a wealth of experience that will help us overcome the challenges we face. I’m very much looking forward to working as a team with Deborah and developing a strong partnership approach across Suffolk and with all of our partners. “Deborah understands the way people in Suffolk live and do business and I’m confident that her pragmatic approach to solving issues will be well received. Her salary is to be set at £155K with no bonuses which is some 64K less than Andrea Hill received. The Council are also at pains to point out that they handled the recruitment internally and did not use expensive "headhunters". My congratulations and best wishes to Ms Cadman. In the nicest possible way we hope we hear a little less of her in the news than her predecessor!